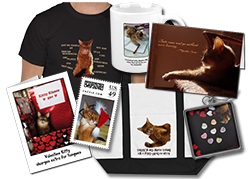 You are here: Home / Shop / Cat Stuff for Humans / New Easter Card in My Zazzle Shop! New Easter Card in My Zazzle Shop! Well, it is now a card in my Zazzle shop! So far, no more bunny costumes this year for me. You are THE cutest bunny wabbit ever!!! So, so cute! Our male human has your calendar at work, and smiles every time he sees you in those bunny ears! Love it! Love you, too. Purrs, Seville. Awww! Youa re a really sweet wee bunny!! 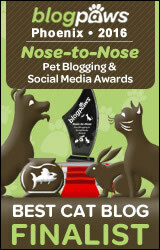 MOL!! 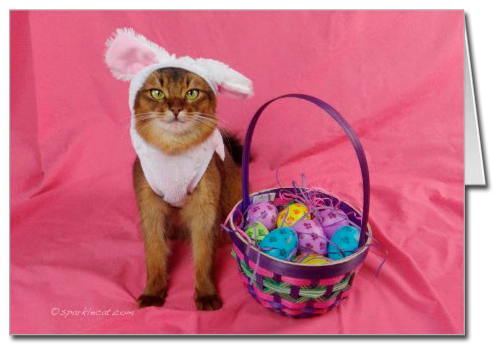 I think your whiskers really complement the bunny ears. How adorable! You really rock that bunny costume. 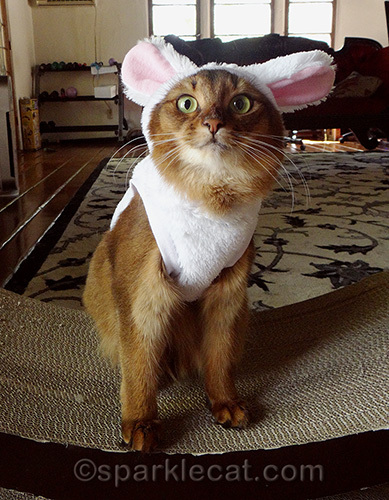 Yous makes the cutest Easter Bunny….So cute, mes thinks yous might end up dresses up again!!! That is a very cute card! SQUEEE!!! How cute is that!